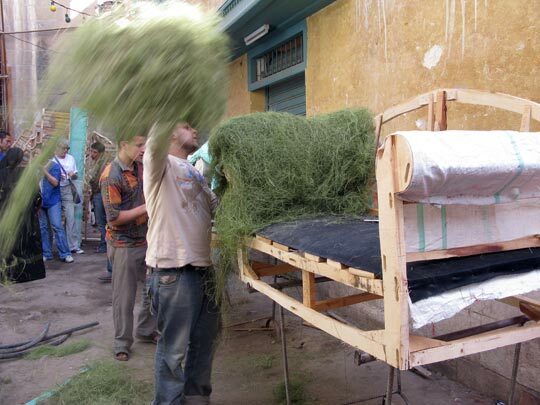 Slow but Sure Environmental Progress in Cairo A short distance from the new $30 million Al-Azhar Park in Cairo, Egypt, young environmentalists are installing solar hot-water heaters in poor neighborhoods. They're overcoming setbacks — and bridging religious divides — to bring change in a time of environmental upheaval. Cairo's 74-acre Al-Azhar Park is the former site of one of the city's largest dumps for rubble and garbage. The Cairo Citadel, with its delicate spires, looms on the horizon. From left: Hanna Fathy, Solar Cities founder Thomas Taha Rassam Culhane and Mahmoud Dardir. 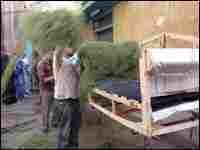 They are installing environment-friendly solar hot-water heaters on the rooftops of Coptic Christian and Muslim communities in Cairo's slums. 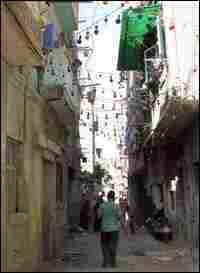 Cairo's Darb Al-Ahmar Muslim community is part of what is known as "Medieval Cairo." 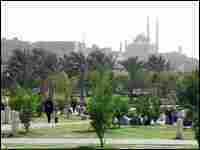 Al-Azhar Park separates this slum from the city's predominately Coptic Christian slum. The Darb Al-Ahmar neighborhood thrives with craftspeople, carpenters and furniture makers. Amid Cairo's sprawling cityscape, there's a lush retreat where Egyptians can find some breathing space. 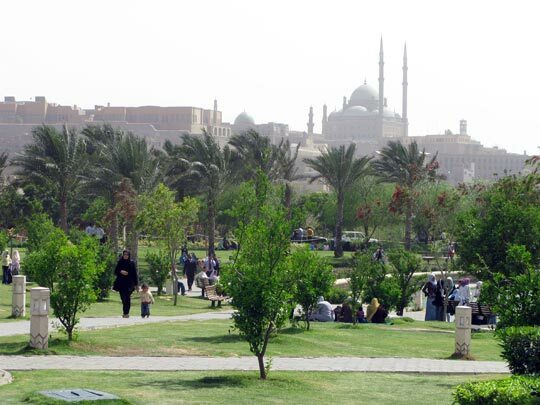 Like New York's Central Park, the 74-acre Al-Azhar Park is a green getaway for the city's 17 million residents. But less than a decade ago, Al-Azhar Park was little more than a mound of dirt and trash — a 500-year-old garbage dump. "It was ... the shame of the city," says Thomas Taha Rassam Culhane, founder of Solar Cities, a group that is installing environment-friendly solar hot-water heaters in Cairo's slums. At a cost of $30 million, the Aga Khan Trust for Culture hired world-class Egyptian, European and American architects who worked with the city and local residents to create Cairo's first new green space in more than a century. Today, architects from the trust are working with Culhane's group to build and install his signature blue barrel solar hot-water heaters on a larger scale in the area. With a grant from the U.S. Agency for International Development, Solar Cities is trying to bring about environmental change in an age of global warming. Culhane and a small group of environmentalists living in the city's slums have placed several water heaters on rooftops throughout Cairo's poorest neighborhoods in the past six months. The Solar Cities project is particularly important, Culhane says, because climate change means that the poor can no longer reliably live off their environment. "In ... pre-industrial times, the poor could depend on the sun shining at certain times, the rain falling at certain times, the river flowing, rising, depositing fertilizer... this subsidy from nature meant that even if you were financially poor, you could lead a fairly rich life in terms of comfort," Culhane says. "The predictability is now gone. The poor can no longer depend on their environment for any kind of subsidy." 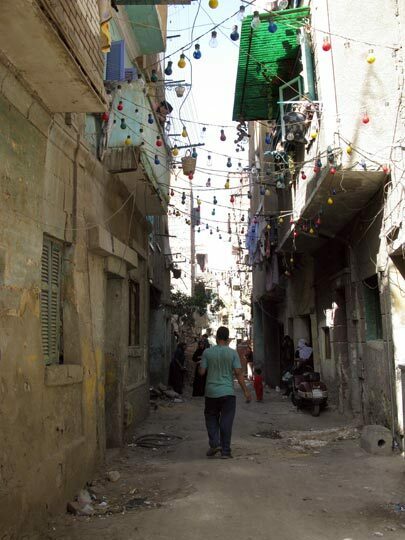 Mahmoud Dardir, one of Culhane's young environmental proteges, lives in the city's Darb Al-Ahmar Muslim community, part of what is known as "Medieval Cairo." Dadir has built a handful of Solar Cities' water heaters. He also helped to create an environmental science center in Cairo to raise awareness of climate change and environmental problems. Dardir says his generation has a responsibility to protect the environment. "My teacher in my high school told me if you want to do something, start with yourself and invite others to do the same," Dardir says. "Maybe it will take time, but there is light." To get to the gates of Dardir's neighborhood, visitors pass an ancient graveyard called the City of the Dead, where some of the larger tombs have become squatters' camps. The gates themselves are flanked by old stone facades, and the community's labyrinth of shaded stone streets thrives with craftspeople, carpenters and furniture makers. On a recent day, Dardir and Culhane visited a house where one of the solar hot-water heaters they installed wasn't working properly. They quickly found that the problem lay with the heater's custom design. "We made five different holes in the side of the barrel until we found the hole that worked perfectly with that particular barrel," Culhane says. "These are some of the challenges in a country where things are not standardized." Aga Khan officials say the solar heaters need to be tested and the kinks worked out before they are widely implemented. "It is needless to say that a leaking solar water heater ... can really make the local community reluctant to adopt and implement such technologies," Kareem Ibrahim of the Aga Khan Development Network says in an e-mail. "Therefore we're testing these technologies first on a small scale until we rectify any unexpected problems then disseminate and demonstrate them for ... the local community." Of the setbacks that Culhane and his small team face, culture clashes have not been among them. Dardir, a Muslim, and fellow environmentalist Hanna Fathy, a Coptic Christian from the Manshiyet Nasser slum across Al-Azhar Park, work together to build and install the rooftop solar contraptions. For Culhane, the social nature of the project is particularly important. "We felt that you had the Al-Azhar Park and the City of the Dead separating these vibrant, but very different communities. And if we could find a reason to get together on a daily level — to cross that divide — then this interchange, this exchange of ideas, would begin to create its own flow," Culhane says. And his young team says that fighting over religion, politics, class and culture wastes time in an urgent period of environmental upheaval. "If we're still thinking Christian, Muslim, Christian, Muslim, we will never move and we will stay in our place. We'll never do anything," Fathy says. Radio stories produced by Davar Ardalan and Ned Wharton.